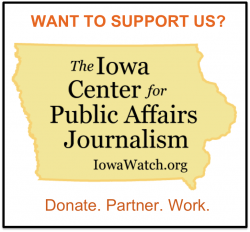 The Iowa Center for Public Affairs Journalism is in a yearlong campaign to raise donations from 1,000 individual and corporate donors. Long-form, in depth investigative and public affairs journalism. Being transparent about its work and its funding sources. Training college students in Iowa to do a high level of reporting that can be published on professional platforms. The Center has received major grants totaling $200,000 over two years from the Ethics and Excellence in Journalism Foundation, plus grants from the Nicholas B. Ottaway Foundation, SourceMedia Group of Iowa (The Gazette Co.), Woodward Communications, the Burlington Hawk Eye, the Community Foundation of Johnson County and the Fund for Investigative Journalism. It also has received significant support from the Investigative News Network, a collection of more than 80 non-profit, community-based news organizations to which the Iowa Center for Public Affairs Journalism belongs. However, we are striving to get local support from enterprises and people in Iowa or with an interest in the state. That local support is key to non-profit, non-partisan news organizations such as ours. We hope to expand our reporting with the kind of depth that the public, which includes local business and organizations, needs to be better decision makers.